The third installment of writer-director M. Night Shyamalan’s trilogy that began in 2000 with the film UNBREAKABLE and continued much to everyone’s surprise 16 years later with SPLIT has arrived with GLASS. Many of the original characters are back including David Dunn (Bruce Willis, DEATH WISH (2018)) and his son Joseph (a now grown up Spencer Treat Clark), Elijah Price (Samuel L. Jackson, LIFE ITSELF; THE HITMAN’S BODYGUARD; KONG: SKULL ISLAND; THE HATEFUL EIGHT) and his mother (a now grey Charlayne Woodard), and Kevin Wendell Crumb and his 23 other personalities (James McAvoy, SUBMERGENCE; ATOMIC BLONDE) and one of his captives from SPLIT, Casey Cooke (Anya Taylor-Joy). They’re all joined this time by psychologist Dr. Ellie Staple (Sarah Paulson, BLUE JAY; OCEAN’S 8; THE PEOPLE V. O.J. SIMPSON; CAROL) whose mission it is to convince the three men that they suffer from delusions of superheroism. I try not to read other people’s reviews or even watch the trailers before I see a movie so that I can go into the cinema as a blank slate. With GLASS, I was aware that it was getting negative reviews though I didn’t know why. For the first hour, I was thinking that it’s really not as bad as people were making it out to be. Yes, it’s slow and yes, there’s a lot of talk and not a lot of action but I kept thinking that it would go somewhere interesting. Well, it didn’t. It just got more ridiculous and less interesting. For most of the film, Price is in a drug-induced catatonic state and that’s pretty much how I felt while watching the second half of the movie. Though it tries to be smart with its self-aware superheroes and superhero genre references, it completely lacks the kind of tension and excitement one might rightly expect to see in a superhero film. Instead, we’re given Dr. Staple, who must be the dumbest and least effective psychologist in Philadelphia if not in the world, talking and talking and talking. Shut up, woman! If these three characters are going to take each other on, let them get on with it and let it be done in grand, superhero fashion. Unfortunately, when that does finally happen, it’s a huge letdown. Maybe Shyamalan ran out of money because the set piece that is alluded to never gets there and the mano a mano ultimate confrontation that does take place would have been a complete yawner if it weren’t so horribly executed. Why does this guy have such a devoted fan base? I liked THE SIXTH SENSE as much as the next person but that was ten films and twenty years ago. 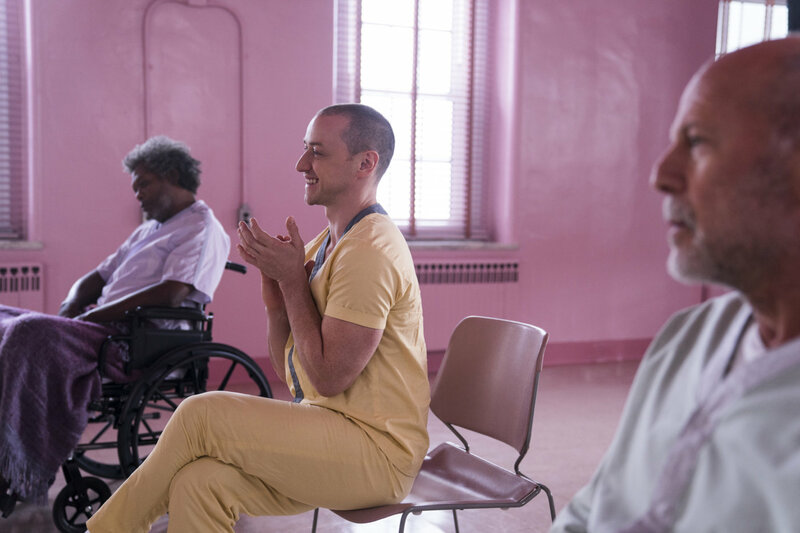 In a recent interview, Shyamalan said that the original cut of GLASS was three hours and 20 minutes long. This cut is just over two hours and, as it is, it’s about 30 minutes too long. You couldn’t pay me enough to watch another hour of it. One critic has boldly proclaimed GLASS to be the worst film of 2019. While being a rather hyperbolic statement, I see his point. This GLASS isn’t even half-empty. Watch the review recorded on Facebook Live on Friday, January 18th at 8:30 am HK time!